Is the Amsterdammer where he really wants to be? There are whole tribes living in Amsterdam who would rather be somewhere else: somewhere in the past. There are people who have come from faraway countries. They have difficulty adapting. They find Amsterdam difficult, they think, and they simply cannot get used to Western society. But that’s not it. They have difficulty with the present-day. They dream of their youth, when they still had a grip on their lives. That was in a country far away, with a different culture and a different climate. Born and bred Amsterdammers also have a youth that they reminisce about. They also want to turn back the clock. They have it no easier adapting than do immigrants. The present takes a bite out of the city of their youth every day: all the things that disappear and all the things that are added. There are poignant memories around every corner. I am one of these Amsterdammers: I was born and raised here. Every time I try to negotiate the traffic chaos known as the Leidseplein, my compassionate thoughts turn to the Leidsebosje. Until the 1980s this little copse was nothing more than a few trees and some shrubs in the middle of a roundabout. The roundabout used to stand in front of the modern-day Marriott, and you could ride around it until you reached the right exit. I’ve never actually been into the Leidsebosje, merely peered at it from my father’s car. It’s best to be a tourist in Amsterdam: then you have least trouble adapting. Tourists have no memories of the past. For them, everything is fresh. In the same way parents are much more easygoing with someone else’s children, they cruise around in the knowledge that they will be leaving again. Four million of them come here every year to look at the canals, visit the coffeeshops and the museums. Tourists are a serious is­sue for the city council. In order to please them, the city centre has been designated a protected cityscape. They just have to tunnel the new North / South Line metro through beneath it and then they can set up a ticket booth for the city centre: the centre of Amsterdam as an open-air museum. But isn’t that what the born and bred Amsterdammer wants as well? Then everything continues just like it was? No, that’s not what I want. You don’t gain anything by stopping the clock. And certainly not by turning back the clock. For me, the Leidsebosje doesn’t need to be replanted. The filled-in canals don’t have to be excavated again either. And please let the Paleis van Volksvlijt (Amsterdam’s 19th-century ‘Palace of Industry’ that was destroyed by fire in the 1930s) rest in peace as a stack of photos. The size of two big classrooms filled with chests of drawers, with people nosing around among them, is more or less how you can best imagine what was, until recently, the Beeldbank (‘Image Bank’) of the Gemeente­archief, the Amsterdam Municipal Archives. In the drawers there were photographs of Amsterdam from the seminal years of photography, the middle of the 19th century, up to the present. Subdivided by street. Every Amsterdammer could go and search in those drawers for evidence of his or her past. So there they were, usually huddled in pairs, with a photo of the street where they were born in their hands. Look at this! Just look at that! Do you remember? Or the street where they live now, but then as it used to be. The air was filled with ‘ohs’ and ‘ahs’. At the counter they could order a little print of their find, almost as big as an A4. That cost a couple of guilders at the time, and took a couple of weeks. You can find them in a great many staircases of Amsterdam homes, those photos of how the street used to be. Set in a simple frame. You could also hang them up inside, but then you couldn’t share them with the neighbours. The room full of drawers has disappeared now. The 100,000 photos have been scanned and placed on a server the size of a fridge. Go to www.gaaweb.nl and click on the ‘Beeldbank’ button. You can search by street, by photographer, by neighbourhood. The photos appear on your screen. You can even print them out, for free and without waiting, in a format slightly bigger than a postcard. Slightly too small for the staircase, that’s true. However, there is no municipality in the Netherlands, in the whole world, where the archives are as accessible as in Amsterdam. I miss that room with chests of drawers all the same. I miss the delighted exclamations of people who have dug up something from their past. One day, when the windows are wide open on a summer’s day, I will go onto the street at dinnertime. According to statistics collected by the Amsterdam Municipal Archives, it’s at this hour that the Image Bank gets the most visitors (120 per hour). You never know, I might catch an ‘oh’ or an ‘ah’ through the open windows. ‘Piet Römer!’ we chimed in unison. He shook my hand for the second time. Our memories, pleased with their success, picked up steam. ‘…Parkinson’s,’ the garage owner finished. ‘I didn’t know it was infectious,’ I splurted out before I could stop myself. The garage owner burst out laughing. When I returned home I found 20 photos of the Bellamystraat on www.gaaweb.nl, including one showing the garage and the cinema next door, the Olympia, which is now a Turkish Cultural Centre. There had been a flood, and the cars were standing up to their axles in water. There used to be floods often, the garage owner told me. 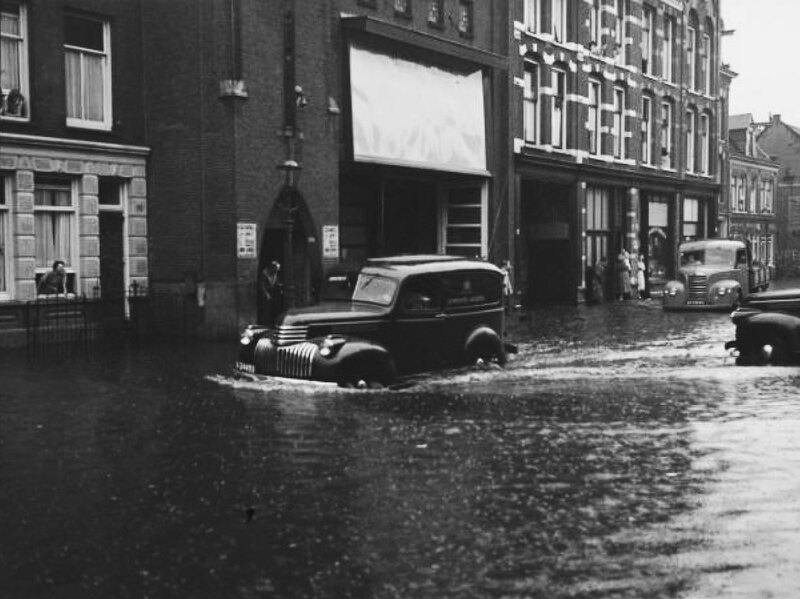 The Bellamystraat was the lowest point in Amsterdam. If anything went wrong with the draining of the polder then they would be up to their knees in water. Then they would go surfing on old doors. The photo was taken in 1951, the year I was born. I printed it out and took it along to the garage. He wasn’t there. The letterbox was so small, a type you hardly ever see now. A slit only 10 cen­timetres wide. I had to fold the photo double in order to get it through. What can the past do for you? It used to be like that, now it’s like this, and later it will be like something else. There’s hardly anything to be learned from the past. Results from the past don’t provide any guarantee for the future. On photos the past looks so rosy. Meaningful and acceptable, like the present never is. Perhaps in 30 years, when the present has itself become the past. You would prefer it if that gap wasn’t there. That you could look at the present with the same acceptance as you look to the past. Photos from the past can’t help you here. Sooner the opposite. They make the gap even greater. It’s best to accept that there’s a gap and that it will never be bridged. Let the present and the past co-exist like two different versions of the same world. One slightly easier to understand than the other. You can dig up Amsterdam’s past in the archives. But where do you find the present? If you want to understand the present then stop harrying the tourists from the cycle path, step off your bike and walk along behind them. Tou­rists, with their innocent gaze, understand Amsterdam better than the Amsterdammers. Tourists know why they have come here. Amster­dam­mers have forgotten, because we’ve been here so long already. Follow them into the souvenir shop and look over their shoulder at the stand of picture postcards. Amsterdam is what the tourists send home to show where they’ve been. An image of a bright yellow bike against a bright green bridge railing, locked with three chains. Wherever that card falls on the mat they will understand immediately: that card comes from Amsterdam. There is only one city in the world where 100,000 bikes are stolen every year. A man’s backside in tight jeans astride an Amster­dam­mertje. Ten naked guys dancing on a boat in the canals. It could only be Amsterdam. Walhalla for homosexual love. The window of a coffeeshop with a man-high symbol of the marijuana plant painted on it. Every­thing’s possible: that’s Amsterdam. A sanctuary for tourists. And for terrorists. For everyone who has the prospect of being somewhere else sooner or later. Fifty years from now, the generation that is currently growing up will look back to this present on www.gaaweb.nl with a hint of melancholy. The days when everything was possible. Or will they perceive it as the era when everything was supposed to be possible. Hans Aarsman is a photographer and writer based in Amsterdam.